Champa has used the power of the assertive voice to communicate to the world that the people of Bhopal will never give up. Champa Devi Shukla has been a leading figure in the international campaign seeking justice for the survivors of the 1984 Union Carbide Gas Tragedy in Bhopal. Starting with protests and rallies in India, Champa took her fight against Union Carbide Company (UCC) and its partner, Dow Chemicals, to the streets of New York and other American cities. Dow Chemicals is today fighting a series of cases filed by Champa and other protesters. 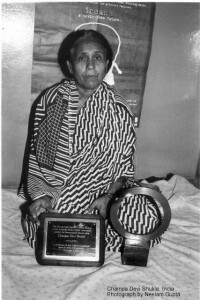 Champa was awarded the 2004 Goldman Environmental Prize for bringing the Bhopal disaster to the international center stage. It has been over two decades since the Union Carbide gas leak killed more than 30,000 people in Bhopal, the worst industrial disaster in history. In 52-year-old Champa Devi Shukla, the survivors found hope. For 19 years now, she has been leading the international campaign seeking justice for them. Champa was married to a government employee who was killed by cancer in 1997. Two of Champa’s sons also died due to health problems as a result of the methyl isocyanate gas leak. Three other children are still alive, but none lead a normal life. Champa started her career in activism by fighting for better labor conditions and wages for women at the factory where she worked. In 1989, all her demands were met. She then leveraged the union’s new-found power to seek justice from UCC. In 1999, she joined activists and disaster victims in a class action lawsuit filed against UCC in New York. Down the years, she has led a series of protest marches, rallies, petitions, and fasts, including a 19-day hunger strike demo in New York in 2002. In 2003, Champa and others confronted officials of Dow Chemicals-which merged with UCC and has since insisted that it played no role in the disaster-in Mumbai and The Netherlands with samples of toxic waste. Champa’s initiative led to a protest tour of more than ten American cities, which culminated in a protest at a Dow shareholders’ meeting in Michigan, and a rally on Wall Street. Champa was awarded the 2004 Goldman Environmental Prize, recognition of her efforts in bringing the Bhopal disaster onto the international stage.